In Tarot for August 2019, The Judgement is the arcana that dictates what will happen during the month and it represents quick, thoughtful and somewhat emotional decision making. In life there are times when we must make decisions that will affect our future. Undoubtedly, these actions often cause us fear because of the often unpredictable result that may follow. In Tarot for August 2019, The Judgement tells us precisely this, that we must make a final, reasoned and decisive decision. However, this decision allows us to apply both our reason and emotions, or feelings, something that, for example, the arcana of justice does not allow because it only believes in the application of reason. Thanks to the decision we take, there will be a positive change that will allow a new stage to develop little by little. This card is considered as an illumination because it allows us to understand the meaning of things and in this way helps us to advance along the complicated path that is life. In the card you can see an angel, a spiritual entity halfway between God and men, who plays a trumpet indicating the end of a trial. The recipients of his call are three people: a man, a woman and a child. The three are naked and look up attentively to hear the result. 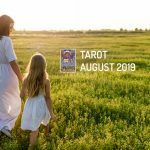 What the symbolism of this tarot card for August 2019 wants to demonstrate is that it is a call to our interior. Through this celestial trial we will understand what we did wrong and this allows us to be spiritually reborn again. It is a reconciliation with ourselves and with others in general. Thanks to the lucidity of our judgement we can make a correct and coherent decision that allows us to move forward. In order to do this we will use our brain, but we will also let ourselves be partially influenced by our heart. The propitious moment to free ourselves from past problems that weight us down so we can resurface again, with very few problems but full of hope. In this way, what we decide for ourselves will be completed in a very short time. Something that we can see reflected in different areas. Thus, on the professional level, our projects will be approved and we will be able to receive a promotion, or if you are unemployed, the situation will change radically. Sentimentally, we could receive news of past lovers that resuscitate old feelings that although almost forgotten, are still dormant. Regarding the current relationship, it will be time to make an important decision about the relationship, either leaving it because it is not what we want or changing the attitudes we have shown so far in order to save it. Our health will improve and we will be cured of diseases that have been bothering us for a while, sometimes through the use of unconventional therapy. Regarding money, we will receive income thanks to the paying off old debts or judgments that are resolved in our favor.